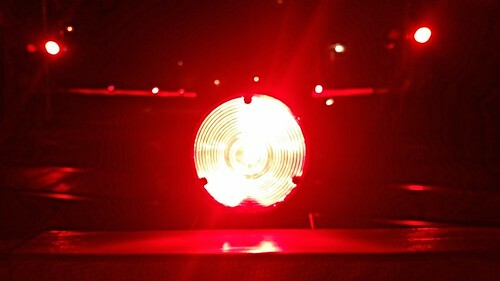 A red blinking light at a train crossing at full brightness. Today and tomorrow's photographs are almost the same except that this is the light at full brightness and tomorrow is the light turned off. While waiting at the train-crossing, I thought this made for an interesting set up with the ligth at full brightness, the darkness all around and the background of the lights and beams on the other side of the track.